Taking my time to find my words. A month has passed since walking into Urgent Care to learn about the initial signs of cancer. It was my hope to start this blog sooner; however, between a few weeks of initial pokes, surgeries, and over a dozen doctors appointments and going through my first chemotherapy- I needed time to get the words under my feet. The namesake of this blog was my fascination with socks and my soon to be bald head. I imagine my spunky sock choices to compensate for my lack of hair. It also seems to be a catchy and easy title to remember. After a decent amount of sleep, I woke up feeling pretty good today. I sent a snapchat to several friends, “Some days I feel so good I forget that I had cancer.” Numbness in my toes and fingers have the most persistent symptoms and usually only lasts a few minutes. The trick I have found is to change the position of my arms and legs. For example, having my legs crossed will lead to numbness in my feet much quicker so should be avoided. This is a common symptom for my chemo treatment and is only a concern if it persists for days. The hope is no permanent damage of my nerves occurs. Throughout the blog I will discuss challenges I encounter so I will number them as I go to reference. Managing numbness will be challenge number one. Challenge number two is being ok with my body becoming weaker. Growing up, I was rarely sick and my mom wanted me to be grateful for a strong and healthy body. Beyond having an impressive immune system, I worked hard to manage my diet and workout every day. For two years, I was vegan and was known to manage stress, sleep, pain, and so on with supplements. When challenged, I would find control in strength and taking care of my physical and mental state at yoga, the gym, or the ice rink. Now, I must be ok relying more on others and having to find alternative workouts I can handle and that avoid dirty gyms. Watching my body, something I worked hard to keep strong, weaken in the mirror is difficult. It all comes with the many ironies of cancer. Chemotherapy is there to kill my body so that it can survive. The procedures, appointments, and infusion are much harder on me physically and mentally than the cancer itself. It is confusing to have to suffer to get better. Throughout the past month, I have received some incredible love and support from people all across my life. I am grateful for the prayers, flowers, food, outings, walks, hugs, cards, calls, messages, and every other form of outreach that has made me feel loved. Today, I was tagged in a post on Facebook. 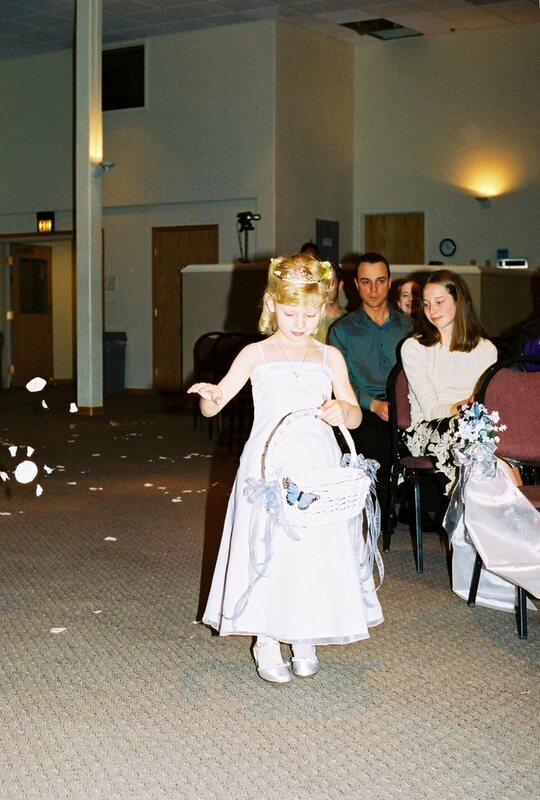 A family-friend, former babysitter, and amazing person is celebrating her fourteenth wedding anniversary that I happened to be a flower girl at. A part of her festivities was donating her hair for wigs. 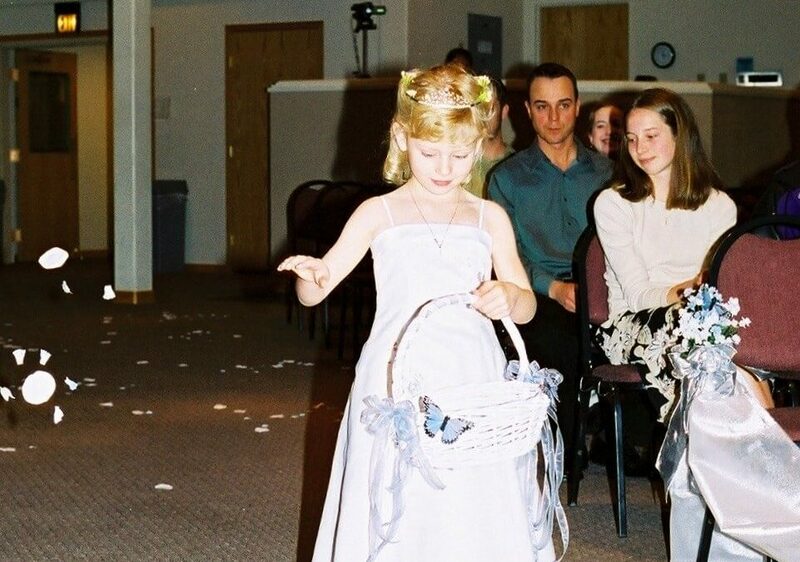 It really means a lot to me for her to think of me on her special day. Also, I had a really nice conversation with my aunt and uncle who live in Maryland. It has been hard to transition from being in school out East to being back in Colorado. Throughout being homesick during first semester, I utilized my friends and family in the area. After getting much closer with them, it is hard to be away from them again. I enjoyed filling my aunt in and discussing my recent movie and TV viewings with my uncle. 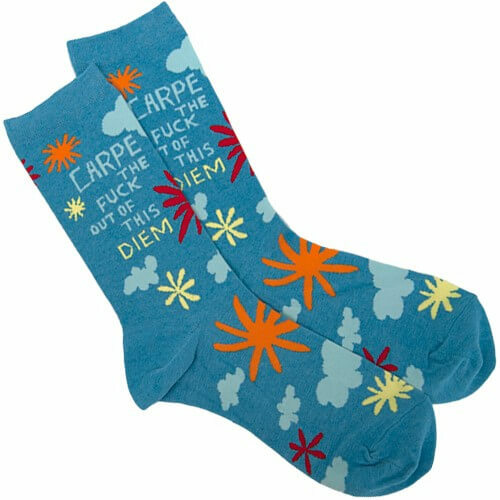 Pair of socks for the post: Carpe the f*** out of this diem. I felt good this morning and wanted to make sure today was going to be a good day. While walking around CSU’s campus, I saw another girl wearing the same socks and it made me happy to think other people enjoy and wear the socks that also make me feel better. Song of the post: Stronger by Kayne West. An original Daft Punk song Harder Better Faster Stronger. Over a year ago I ventured to Florida for a family vacation with my mom, stepdad, and cousin. On the last day of the trip, my cousin and I made it to Hollywood Studios on a rainy, cold day. Originally there for Harry Potter World, we could not help but notice a large roller coaster in the center of the park. Initially, we both said there was no way we would get on the roller coaster. Something changed our minds within a few hours and there we were in line for this roller coaster. The neatest part of the roller coaster was being able to choose a song to listen to while on the ride. Being scared to pieces, I choose Kayne’s Stronger. Although the scariest time of my life, I survived and as the lyric goes, “That which doesn’t kill me makes me stronger.” Nothing seemed unconquerable going forward- I had overcome something extremely scary with my cousin and now I knew I could get through fear. A pretty-big epiphany for a day at an amusement park. I recommend giving the song a listen even if you are not a Kayne fan. Still don’t think you can do it? Give the Daft Punk version a listen, it will get the point across. So when I am scared now, I think back to the moment I overcame an obstacle with my might, good music, and the hand of my lovely cousin. Looking Forward: Somewhat daily check-ins (bear with me at the beginning) and a Q&A post. If you have any questions, leave them in the comments below and I will include them in the Q&A post! You’re so brave and strong! I can’t wait to hear more about your experiences! We always knew you were extremely talented and you continue to amaze with the quality of your writing and the honesty of your observations about your condition. You are facing a formidable foe, but I have no doubt that you will vanquish it. It will be tough, so remain strong and know that you have our love and support among all the others that are pulling for you. I look forward to reading about your journey and being a member of your support team. You’ve got this! And for those moments when you don’t think you do- just reach out cause we’ve got you! Love, strength and peace to you and your family! You write beautifully. I love the socks! Kanye West’s “Stronger” is Always empowering! I felt so mad for you at that silly nurse at Urgent Care, but thank goodness that there was a good one who was determined to find the cause of your cough and take things seriously. You are an inspiration. I look forward to reading your next post. You would have been so proud of your mom (or “mum” as we say in Australia) – she gave a couple of amazing talks. Thinking of you everyday and we are keeping you in our prayers… Wendy (who used to work with your mom at CSU when you were little :)!) I hope you keep writing! Elizabeth…I’m late to the game with your blog but catching up. How therapeutic for you and helpful for us that you are doing this! I’m gripped and using everything I read as fuel for my prayers for you! Keep writing Elizabeth. Your words are power and strength. Much love! I love those socks. My wife bought me the same pair when I was diagnosed with Hodgkin’s back in 2016. Found your blog via the recent LLS email blast…makes me wish I would have written one during my journey. Congrats!